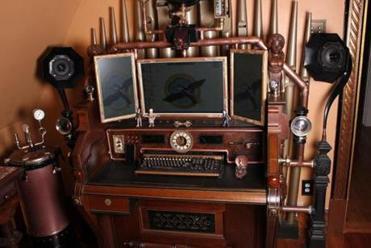 Bruce Rosenbaum and his wife, Melanie, have turned their home in Sharon into a Victorian-themed steampunk showcase. SHARON - He waits for you on the front steps, glancing at a stopwatch on a chain, one hand tucked into the front pocket of his Victorian-style vest. Then a nod, a handshake, and you’re inside the three-story, gabled turquoise house just a block from Sharon’s downtown. You look around: There are clocks and coat racks with fantastical, doodad-covered bases. A pump organ-turned-21st-century work station. A closet door with a porthole that opens by valve wheel. And a desk with a polka-dot wheel that maybe - just maybe - could be a time machine. And you think to yourself: What did I do here, walk into some kind of Jules Verne fantasy world? His house is filled with them, but here are some of his favorites. “It’s old and new at the same time, past and present,’’ said Bruce Rosenbaum, the Victorian-dressed (and, as he’ll admit, obsessed) host, who has become a mad scientist of sorts in this whimsical domain. It’s a world of “what-if’’: Steampunk melds eras divided by centuries, fuses opposites, coaxes the inside out. Heavily influenced by the likes of Verne and H.G. Wells - and believed to be coined in the 1980s by science fiction author K.W. Jeter - it involves reimagining and reinventing period objects, most notably from the Victorian age. Gears, mechanical gadgets, nautical and steam power elements, and cast iron are all imbued with 21st-century technology. Just over 10 years ago, he - like many who may be reading this - had never even heard of that term. 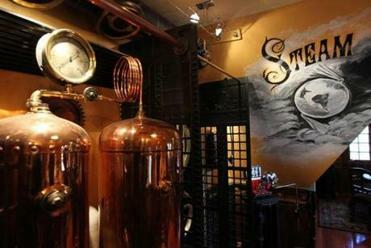 Now he is redesigning his 5,000-square-foot, 1901 home, room by room, into a steampunk showcase. He started two companies, Steampuffin and ModVic, through which he’s had commissions to design single pieces - such as turning an old phone booth into a Skype station - as well as full restoration projects in business offices and historic hotels. 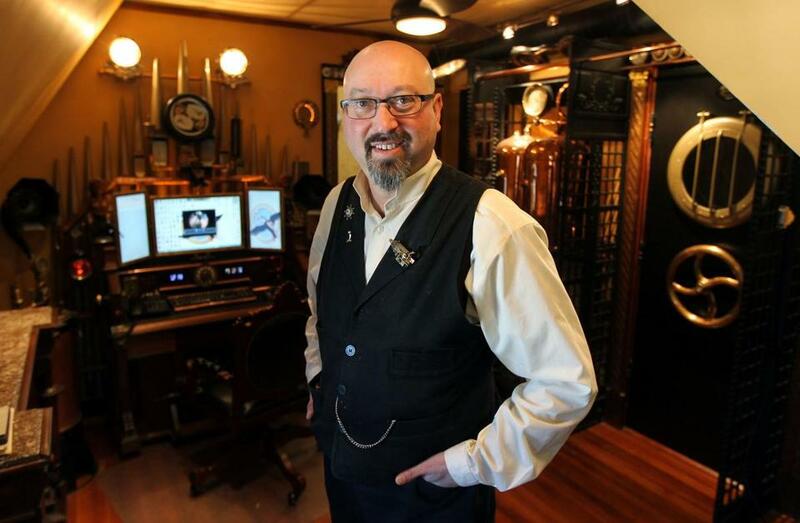 He’s been involved with dozens of art exhibits and antique and craft shows throughout the country - including at a Manhattan tattoo gallery, as well as the upcoming “Steampunkinetics’’ at Animazing Gallery in SoHo, opening June 28 - and recently paired up with Audio Concepts in Boston to create a steampunk home-theater showroom. Then he’s pitching a reality TV show (consider it a steampunk version of The History Channel’s “American Restoration’’), and there’s a book in the works, too. And all this is in addition to helping to raise his two sons and running a marketing company, N2N Direct. At Rosenbaum’s house, a moonshine still awaited a new purpose yet to be imagined. “It started out as just a hobby, a passion,’’ said Rosenbaum. It was a 19th-century stove that gave him his first shove. 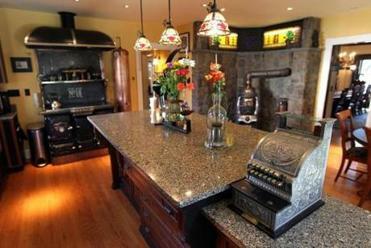 When he and his wife, Melanie, moved into their 111-year-old home, they decided to restore a cast-iron Defiance wood-burning cook stove, giving it a modern glass cook top, and using its warming compartments as storage for pots and pans. Then, they just kept going. One such object was a Berry and Orton Co. bandsaw, which Rosenbaum incorporated into a desk/conference table for Boston patent lawyer John Lanza. The 1880s cast-iron saw is the showpiece of Lanza’s office at Foley and Lardner LLP: Standing upright, it gives the illusion of being cut in half, with the desk at its center, and two giant wheels above and below. He liked it so much, he decided to steampunk his whole office; he now has Rosenbaum fashioning an old lathe into a credenza. “There’s something very appealing about taking an old piece of equipment that once was useful, but in today’s world is just garbage, and repurposing it back into something useful,’’ he said. It is a sensibility Rosenbaum wholeheartedly shares. But, he said, it’s also about the inherent challenge of each project. “It’s learning history, using both sides of your brain, and making things functional,’’ he said, noting that he has a particular affinity for Victorian-era items because of their nostalgia and beauty, and also the pride people took in making them. But climbing the stairs to Rosenbaum’s third-floor office is to enter a truly alternate world: There’s an antique rotary phone, a binnacle (or ship’s compass) that looks like a squat wooden robot and serves as a storage unit, telescopes and rare clocks, Victorian optometry gadgets, and copper moonshine stills awaiting inspiration for a future project. A circa-1880s pump organ has been updated to include a computer with a three-screen array, a webcam, scanner, and keyboard. And the centerpiece: a late 1800s pump organ fashioned into a desk with a three-monitor array, a tucked-away digital scanner, a keyboard outfitted with typewriter keys, and a Brownie camera that works as a webcam. The organ’s pipes, still intact, rise out of the back like a utilitarian array of peacock feathers. Even the casing on Rosenbaum’s USB flash drive has a Victorian look, as does his smartphone - he attached an 1882 pressure gauge to the back of it. Elsewhere in the house - whose unassuming, remodeled exterior and well-manicured yard reveals nothing of its whimsical interior - there’s a Graphophone, a working elevator, and an entertainment center and flat-screen TV integrated into a salvaged mantel and 1880s stove. And, if you happen to use the bathroom, you might ponder for a moment over the pull-down flush toilet. Many of the items are salvage, discovered through frequent trips to flea markets and fairs, through a network of dealers, or on eBay. And, ultimately, it’s been a transformative experience that goes far beyond the objects.